In Ann Petry’s book titled “The Street” there is an in depth examination of reality of life in the inner cities where death and dying are common place and just getting by provokes feelings of complacency for the type of life that is available. This is a topic suggestion on The Street from Paper Masters. Use this topic or order a custom research paper, written exactly how you need it to be. In Ann Petry’s book titled “The Street” there is an in depth examination of reality of life in the inner cities where death and dying are common place and just getting by provokes feelings of complacency for the type of life that is available. “It wasn’t just this street that she was afraid of or that was bad. It was any street where people were packed together like sardines in a can. And it wasn’t just this city. It was any city where they set up a line and say black folks can stay on this side and white folks on this side,…It was any place where the women had to work to support the families because the men couldn’t get jobs and the men got bored and pulled out and the kids were left without proper homes because there was nobody around to put a heart into it.” These words penned by Petry sum up the cynicism that settles on those who have no choice but to make a life on the streets because fate has left them with no other option. The heroine of Petry’s book, Lutie Johnson wants nothing more than to get away from the city and the pull of the streets for her son and herself. Petry leaves no thoughts for the imagination as she bluntly expresses the harsh realism seen each day through the eyes of Lutie. Just stepping of the bus on a beautiful spring day and enjoying the freshness after the dull of winter can be disrupted by the inescapable reality of death. “’White man in the baker shop killed him with a bread knife…He had the bread knife in him and he walked to the corner. The cops brought him back here and he died where he’s layin’ now.’” The way in which Petry tells her story, the reader can sense the expectancy these people have toward events such as these. The sister of the young man, dead on the street says only this, “’I always thought it’d happen,’”. 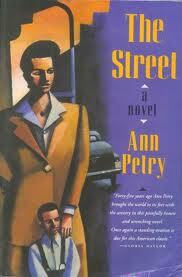 A recurring theme in Petry’s book is the feeling that none can remain decent if they live on the street. Soon each person resorts to the same behavior. Behavior precipitated by the removal of anything just or anything humane. It is easier for people to just turn their heads when they witness crime and pretend they don’t see anything. This is for several reasons. One being they don’t want any repercussion for being a stool pigeon but probably more importantly is the fact that time has dulled the senses of the severity of such happenings. Paper Masters writes custom research papers on The Street and explores a book by Anne Petry about the reality of life in the inner cities.